As part of the expansion of our real estate portfolio, we are always on the lookout for suitable existing properties, the main focus being on condominiums and commercial properties. TATAR Holding is an owner-managed real estate company. We buy in selected cities nationwide multi-family houses, residential/commercial buildings, condominiums and commercial properties, and also vacant restaurants for our franchise area. We are an equity strong, very fast and above all uncomplicated business partner. We act unbureaucratically, in a transaction-oriented and discreet manner. 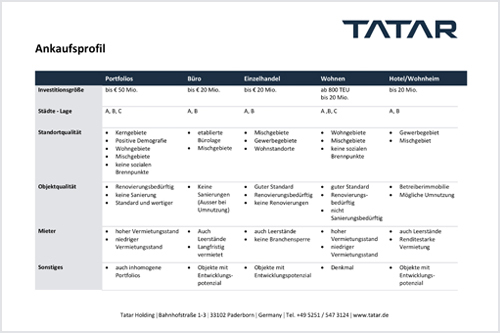 Tatar Holding was founded in 2013 and has since positioned itself on the German market as a broadly diversified company. The focus is on creating true value. These are shaped by Germany-wide investments in the real estate sector.